Cottage in Coimbra, Soure - Property for sale. 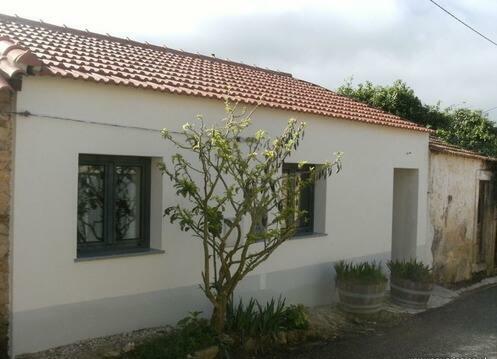 Full Description: Delightful, completely renovated cottage located in a quiet village not too far from the coastal resort of Figueira da Foz (30 minutes drive), 10 minutes from Soure (supermarkets) and 35 minutes from the historic University city of Coimbra. Recently restored the property has three bedrooms, two bathrooms, large living room and kitchen which has been left without units and appliances so the new owner can fit a kitchen to their own taste. There are two entrances, the front entrance accesses the first floor with two bedrooms and a bathroom, then stairs lead down to the lower level with kitchen, bedroom, living room and bathroom and the rear entrance to the property from the garden. Here is a large garden with an original feature stone pool, dry stone walls, trees and plenty of scope for landscaping and vegetable gardens and small parking area. There is also a neighbouring plot for sale should more land be required. Situated in a very quiet and cosy village, with friendly neighbours this house would make a lovely permanent home in the heart of the "real" Portugal. Early viewing recommended. This listing has been viewed 427 times.